Exciting things are happening in your parks! The newly acquired extension of Pleasant Hill Park will remain largely undeveloped as a nature park for the community. The Clean Ohio Conservation Fund provided the Centerville-Washington Park District with funding to acquire the property and remove non-native invasive plants, such as honeysuckle, pear tree and dead ash trees. Tree Care Inc. began this work shortly after the first week of July. Work will take place Monday through Friday for 2 months. 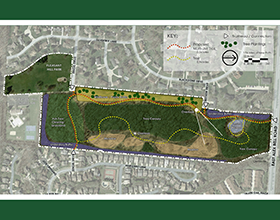 In an effort to be fiscally responsible to the community, we have developed a nature trail plan that the contractor will use while removing invasive species from the park. Our goal is to provide trail users with many different park experiences and offer a nice one-mile loop to enjoy. This plan is consistent with community feedback for preserving open space and the future development of existing and new nature trails. If you have any questions, please contact Nick Meyer at 937-433-5155 ext. 216 or nmeyer@cwpd.org.